If you do any reading at all about trends among young Christians you’ll know that there is a shockingly shallow knowledge of theology among our youth. This is one of the reasons why I’m focusing on teaching theology to our 9 and 6.5 year olds this summer. A while ago, I came across a great little book that had a creative approach to teaching sanctification to young children. I based this activity on the book because our kids often retain a lesson learned through hands-on activities better than those learned through stories. One of the big differences between Christianity and all other religions is that Christians do not work toward salvation (Christians do not earn their salvation through ‘good works’ or obedience, it has been entirely earned and gifted to them through Jesus’ death for their sins and resurrection). Sanctification is what happens after salvation – its the continual process of turning from our old, sinful ways to become more like Jesus. In other words, its a person’s growth in righteousness. Our kids confuse salvation and sanctification all the time. That’s why I loved Robin Gunn’s book Mrs. Rosey Posey and Fine China Plate. It’s a very simple read with young kids and a creative lesson in sanctification. I reinforced the lesson a while after reading the book with our kids through the following activity. 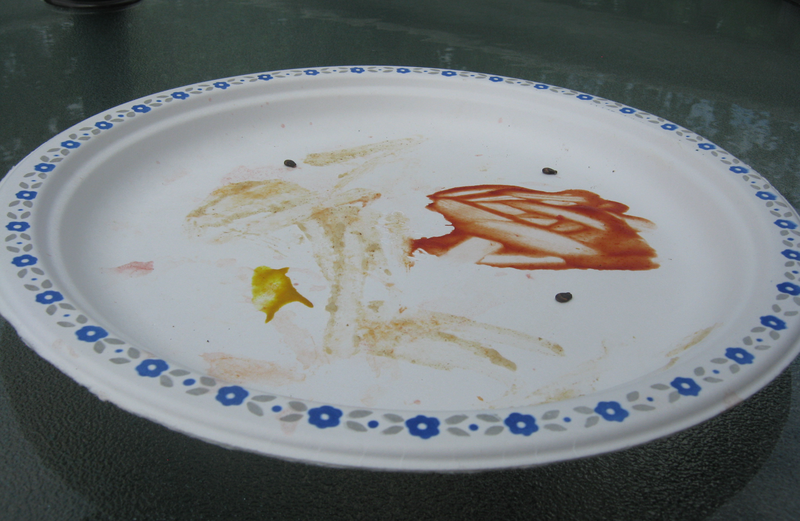 For this activity you need either a very dirty paper plate and a special china plate (or some other kind of fancy plate) OR a dirty, used paper cup and a special wine glass (you’ll need one set of dirty and clean plates and glasses per child). Call your kids down for some sort of a treat. It could be chocolate covered strawberries like in the story, or something else. I made a special smoothie drink for our kids. Ask them if they’d like the treat that you have prepared. When they say yes, tell them you’ll just put it on a plate or in a glass. In their full view, pull out the dirty plate or cup from the garbage can. Pretend that you are going to put the treat on to that plate. If they don’t react, ask them if they’d like the treat on the dirty plate you just pulled from the garbage can. I assume they’ll say no. Tell them that you have other plates (or glasses) that are special and that have been set apart. Would they prefer that you use one of those special plates (show them the fancy china plate or wine glass)? Most likely, they’ll say yes. Now for the lesson. Just like the book, tell your child that he is like that fancy china plate. He has been set apart. Ask him what kinds of choices would make him like the dirty plate. What choices would make him like the fancy one? Tell him that you, his parent, are helping him to make good choices; choices that keep him clean inside. Ask him which plate he’d like to be. Tell him that if he learns to stay away from sin, he will be like a plate or glass made of pure gold. And that is the kind of person that Jesus can use for his special work. The book and activity are based on 2 Tim 2:21. Make sure to read it together. We had this conversation with our kids after discussing what salvation was. This activity was a way to differentiate payment for our sin versus our choices that keep us clean from sin after we begin to follow Jesus. Again, I’m really thankful to Robin Gunn for coming up with this creative lesson for young kids. Ha ha – you are absolutely right! The reference is supposed to be 2 Tim 2:21: If a man cleanses himself from the later, he will be an instrument for noble purposes, made holy, useful to the Master and prepared to do any good work. Thanks for taking the time to point this out!